Pulse Center for Patient Safety Education & Advocacy will never ask you to sign a HIPAA form or to consent to release of your private information because no conversation takes place without you or your chosen support person present. This information will help you prepare items to take when visiting the patient. This list of information should be helpful if you accompany a patient to the hospital as a professional advocate, or as a friend or family member. 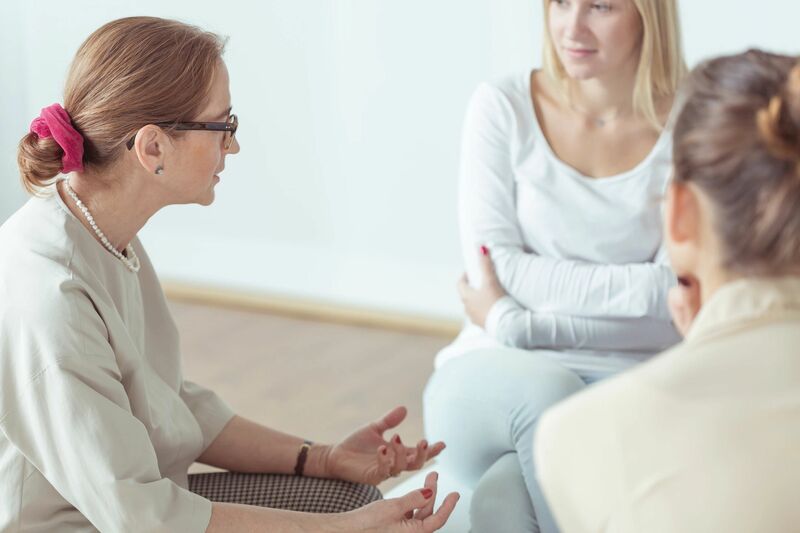 Not all items would be appropriate at all times and you should use your best judgment when preparing to be a Patient Advocate or Support Person. You may also be an advocate for the family, and a family member may be your point of contact. -Notebook: one large pad or notebook for each patient. -Recreational drugs, alcohol use, smoking etc. -Be sure to go over with the patient the list of what you will do. Do this before the doctor comes to see the patient, even if it’s the day before. -Ask clinicians to wash their hands? -Ask questions on behalf of the patient/family? As the patient is talking to you and thinking of questions they may have for the doctor, begin writing down their thoughts. Preparing this when there is no rush is helpful. Do not ask questions for the patient unless you are given permission by the patient (the patient is in charge). -Ask who is overseeing the patient’s care – who is in charge? -When does physician do rounds? When do shifts change? -What unit/room is patient expected to be in after a procedure or surgery? -Is there soap in dispensers? -Washing their hands and stethoscopes or other instruments before touching the patient and before leaving the room? -Asking the patient their name and birth date? Have we missed something? Let us know what has worked for you. Contact us. 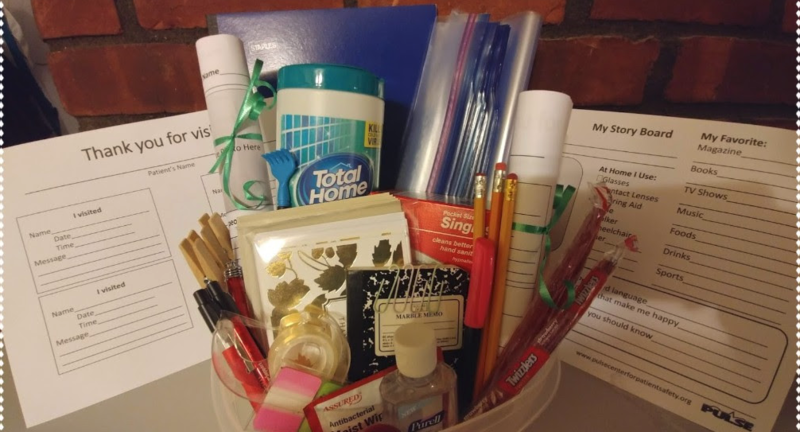 Instead, bring a basket (or bag) filled with hand / body wipes, hand sanitizer, pens and a notebook. 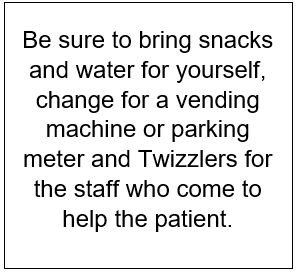 Additional items might be individually wrapped treats, like lollipops or a box of chocolate or cookies for the staff. Leave in the patient’s room and be sure the staff (nurses, nurse assistants, etc.) know that it’s there. They will be sure to visit more often. 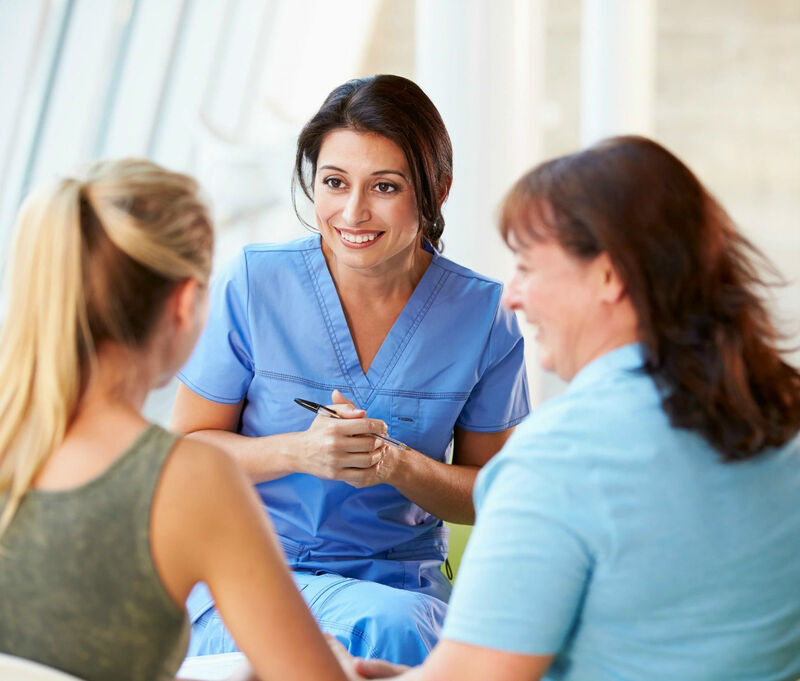 Bring our Patient Safety Tips Quick Guide to help as an advocate. To receive a copy of your Quick Guide brochure, send a self addressed stamped envelope to Pulse CPSEA PO Box 353 Wantagh, NY 11793-0353. Does the patient have a Facebook page? Print out photos of happier times and attach photos to My Story Board and Message Board, or hang where the patient, visitors and staff can see. Print out 'My Story Board' and "Visitors Message Board" and post for visitors to leave messages. Don't forget a phone charger, your own snacks, and wear comfortable clothing. Bring index cards to prepare a "Care Coordination Chart" for family and friends. Have a book or newspaper to read. The patient should not be expected to entertain you. Bring money for food, parking, or to purchase things you may need/want. Bring tape to hang up cards the patient may have received (and the Story Board). For an extensive list of what you can bring as a support person, visit the Patient Assistant list of information. What's worked for you as a patient or visitor? Share your stories. Send to info@pulsecenterforpatientsafety.org. The Visitors Sign In invites visitors to leave a message. The Story Board. Fill in with the patient and hang on the wall so people visiting and staff can know more about the patient. Print and complete with someone you trust. A healthcare proxy is not the same as an advocate. A healthcare proxy can speak for the patient when the patient can't speak for themselves. An advocate is a helper. The Patient Advocate Checklist helps explain the role of the advocate and the needs of the patient. An advocate is not the same as the healthcare proxy. This information is from the book Family Centered Patient Advocacy which was written in collaboration with some of the finest leaders in patient safety. You have been asked to help a friend or family member. You aren't sure what to do, and don't have time to prepare. 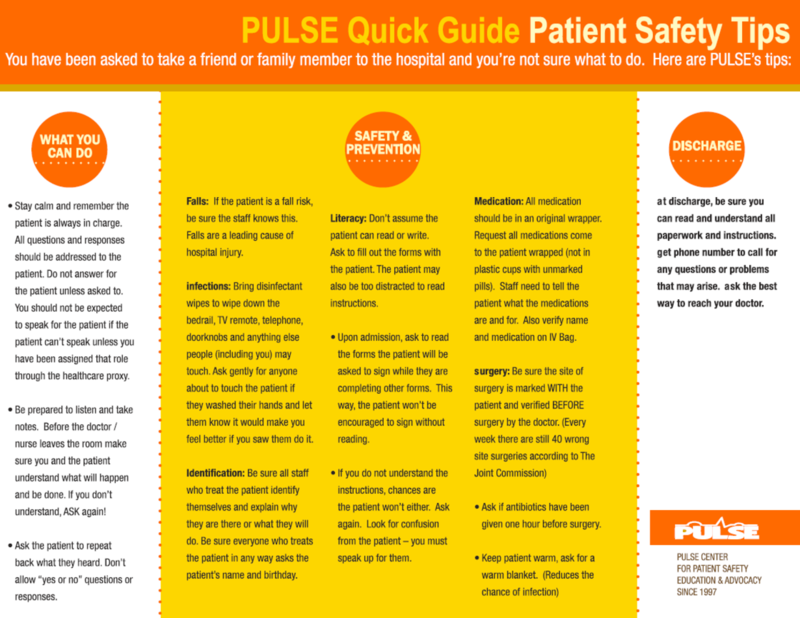 Here is a quick guide to patient safety. Medical history and doctor's names, medication and procedures. Print as many as you want and put them in a folder or binder. Support someone when getting a new medication or have someone support you and be your DMM. When seeing your clinician be as accurate as possible when describing your symptoms, and think STARS. To learn how to interface better with specific or vulnerable populations who are often faced with unconscious bias. For additional resources, go to our Healthcare Equality Project website. Always ask the patient if you may ask a question (the patient is in charge). When you do, this gives the patient time to think of more questions. Be sure to repeat back to the doctor what was said, in words you and the patient understands. Don’t just ask the patient “yes or no” questions such as “do you understand?” Instead ask, “Tell me what you heard the doctor say.” Or you can say to the doctor "May we tell you what we heard you say?" Think of the conversation as a recipe for a cake. If you are missing information or ingredients, the information won't be complete and the cake won't come out right. Writing down information to be shared is like writing a recipe. It must be complete and understood to work. Ask the patient if you should ask staff to wash their hands. If the patient wants you to, be sure to be polite and let staff members know that you “are sure they did already but . . .” you would like to see them wash before touching the patient. (Use patient’s name.) The Centers for Disease Control (CDC) reports 90,000 people die from hospital-acquired infections each year. Ask the doctor what time he/she does rounds after surgery. They may come before visiting hours. If you leave and miss a meeting with the doctor, ask for a phone call if you are the patient’s primary advocate. (Family member, close friend or caregiver). Be sure you have the patient's permission. Never say "I need" always say "the patient needs" such as: the patient needs to know when she is going home or the patient needs to know when the doctor will be here. Encourage the patient to know the three questions from Ask Me 3: What is my main problem? What do I need to do? Why is it important for me to do that? Encourage the patient to share concerns. Do not talk about the patient without the patient being involved. Ask the patient if you could share information. "May I tell the doctor you don't like taking that medication?" What side effects or symptoms should be expected? What if symptoms come back or get worse? What is the actual diagnosis and the prognosis? Make sure you understand medications and any prescriptions. Note the names and phone numbers of doctors or specialists and any other people involved in the discharge. ConsumerMedSafety.org is brought to you by the Institute for Safe Medication Practices (ISMP)—the nation's only nonprofit organization of pharmacists, nurses, and doctors devoted entirely to safe medication practices. Preventing medication errors is no longer just a responsibility for health professionals—consumers like you can also play a vital role. Drug Interactions Checker A drug interaction occurs when the effect of a particular drug is altered when it is taken with another drug, or with food. The Drug Interactions Checker explains the mechanism of each drug interaction, the level of significance of the interaction (major, moderate or minor), and in certain cases, can provide the recommended course of action to manage the interaction. The Drug Interactions Checker will also display any interaction between your chosen drug(s) and food. The Institute for Safe Medication Practices (ISMP), is the nation’s only 501c (3) nonprofit organization devoted entirely to medication error prevention and safe medication use. 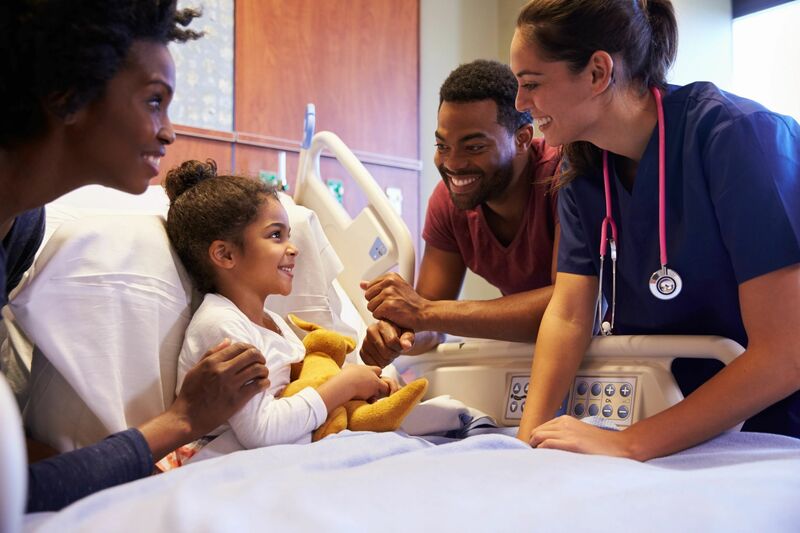 The National Patient Safety Foundation has been pursuing one mission since its founding in 1997 – to improve the safety of care provided to patients. As a central voice for patient safety, NPSF is committed to a collaborative, inclusive, multi-stakeholder approach in all that it does. NPSF is an independent, not-for-profit 501(c) (3) organization. Pulse CPSEA does not guarantee the accuracy or information of these websites but all sites listed have come highly recommended or are sites we use. The mission of 2-1-1 Long Island is to provide all Long Islanders a comprehensive internet connection to human services on a day-to-day basis and in time of disaster. The heart of the Long Term Care Ombudsmen Program is the team of certified Ombudsmen who are empowered to resolve issues surrounding the care and quality of life for people living in nursing homes and adult care facilities. Ombudsmen are there to represent the residents' interests. It is the residents' desires and needs that are considered and acted upon. Use this site to find information about hospitals in New York State, and the quality of care they provide. Visit our sister site 'one is a number' for regularly updated links to studies and information about patient safety and studies about medical errors. Credit card payments for any of our Pulse Center for Patient Safety Education & Advocacy (formerly PULSE of NY) programs, services or events can be made by clicking the 'Donate' link below. PO Box 353, Wantagh, New York 11793-0353.